As those interested in history will know, the princely state of Arcot, known as Carnatic at that time, was set up by the Mughals at around the same time when the first Nizam took charge of the Deccan area. 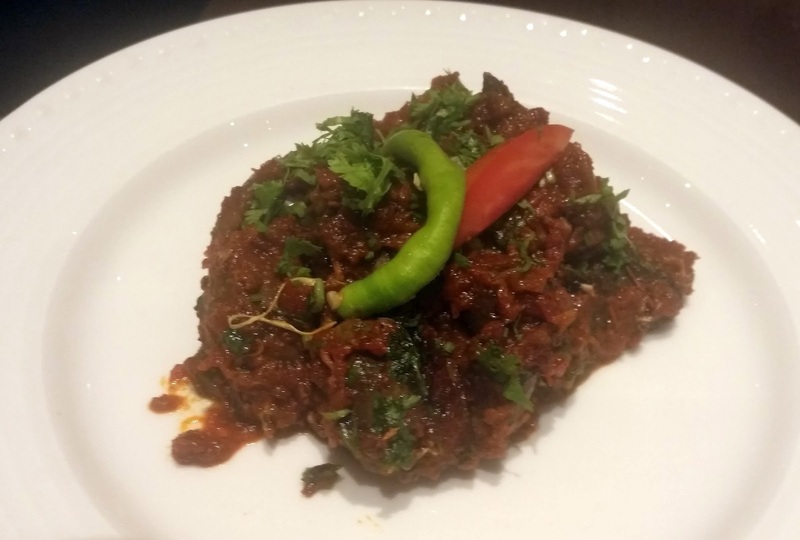 The cuisine of the Nawabs which have evolved over the last three centuries is predominantly Mughlai with a strong fusion of South Indian as well as Marhatta flavours. Arcot Biryani and Makkan Peda are perhaps the most well-known delicacies from this region. The chefs from ITC Grand Chola, Chennai have closely worked with the Royal family at their palace Amir Mahal near Chennai to pick up the recipes and ingredients to make the experience at this promotion as authentic as possible. Chef Abdul Quddus from Chennai who is in Hyderabad curating the promotion told us that the Arcot cuisine is predominantly non-vegetarian, with very few vegetarian delicacies. The promotion is part of the regular buffet at Deccan Pavilion. As is the custom in Deccan Pavilion, the Indian items in the menu are replaced with the specialties from the promotion. 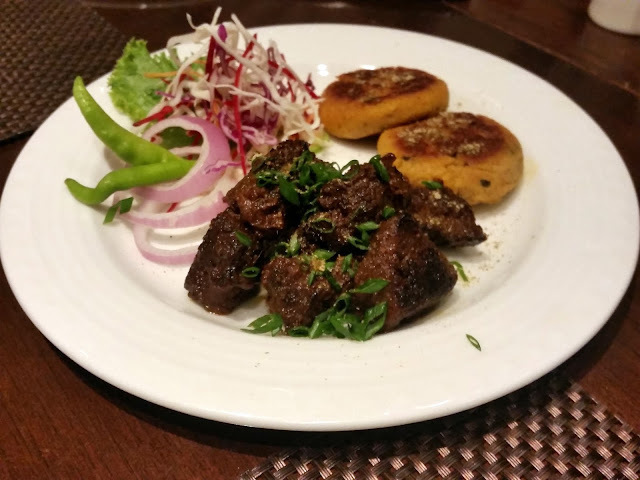 The starters had a delicious lamb preparation where I loved as the boneless pieces of lamb in a dark marinade. I would have loved the Murgh Shikam to be a bit less dry, though weight watchers may be impressed with it. Among the vegetarian starters there was Nawabi Phool, a cauliflower preparation in curd. 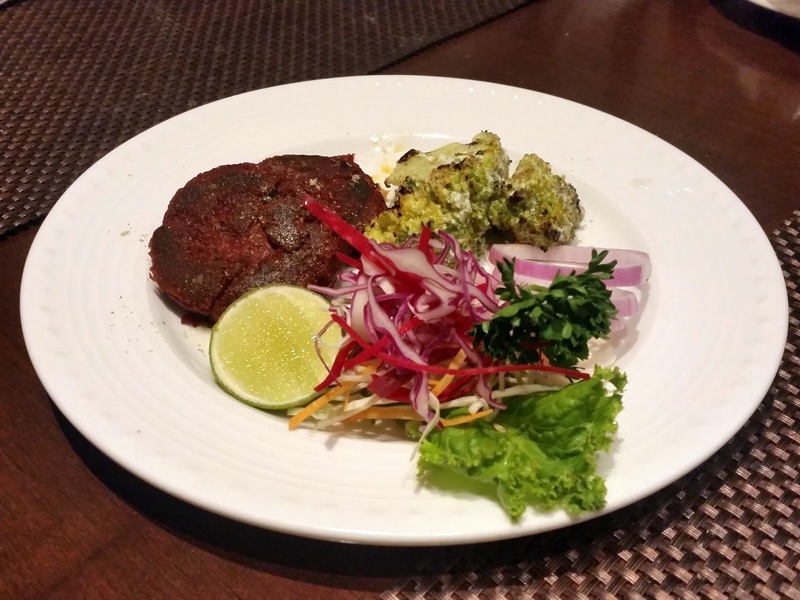 But the best among the lot was the Nilofari Kabab, a spicy beetroot and mixed vegetable preparation on a tawa. The kabab was soft and melted in the mouth, and the spice level was just right. 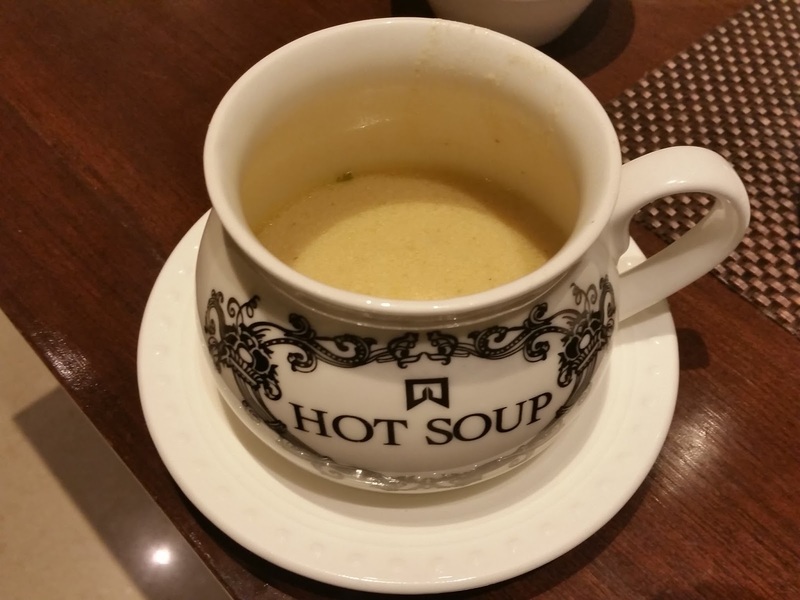 Badam Shorba, a flavoured vegetarian soup, was a little too mild for me. I then tried the other soup Murgh Zafrani Shorba which was a nice saffron infused broth, but a bit high on salt. Arbi Salan, a colocasia based vegetarian delicacy stood out among the main courses – the red gravy was thick and tasty. Apart from this there was Kaddu Dal and a white cottage cheese curry named Paneer Haldi. 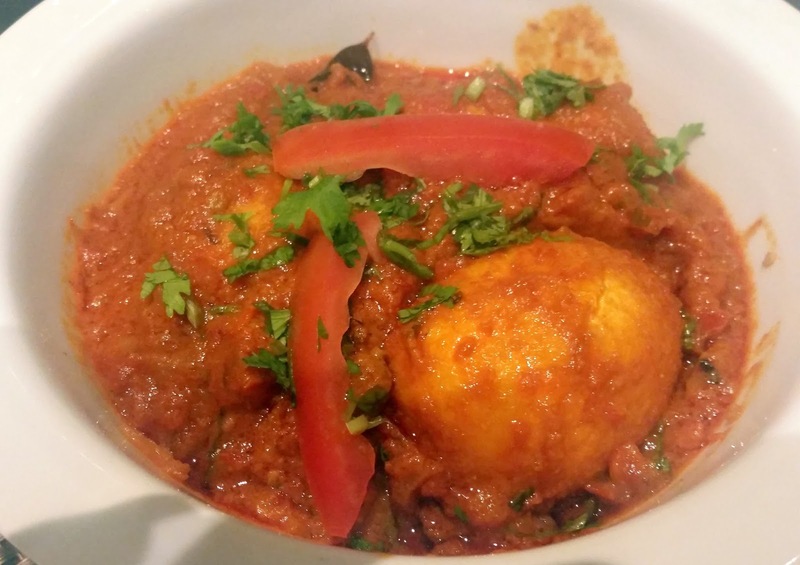 The non-vegetarian fare had Lal Baigan Anda, a tomato and egg preparation. As chef explained lal baigan is another name for tomato. The rich gravy tasted good, especially as I tried some steamed rice with it. 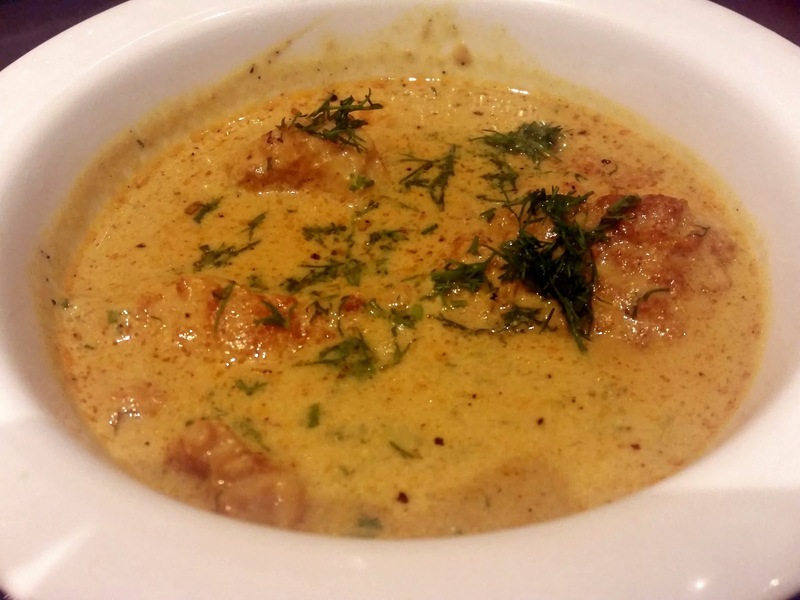 Machhi Soya a yellow colored fish curry used soft Nellore Basa fish. The Gurda Kaleji tasted almost like the Hyderabad version– only the extent of chillies were less. 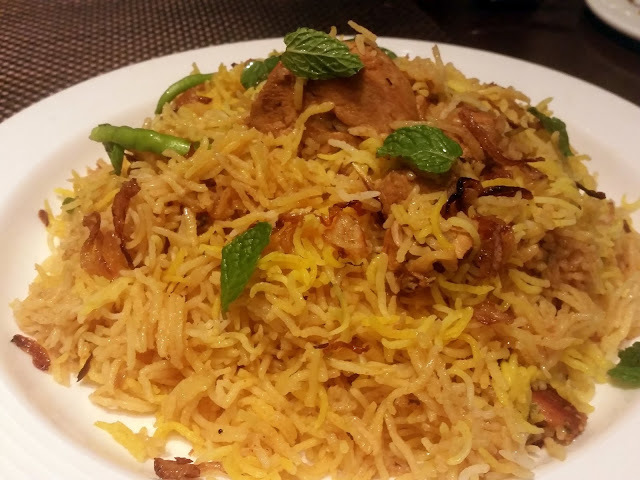 Finally, the famed Arcot Biryani, which is known as the signature item of this Nawabi zaika. While the common belief is that the Nawab had developed the taste for biryani from the Mughals, another story goes that one daughter of Nizam was married into the Nawab of Arcot’s family, and thus biryani reached Arcot through the chefs she brought with her. We had a version called Javahi Murgh Biryani. The biryani reminded me of Awadhi Biryani, very aromatic and rich in ghee, though a little tangier. The masala on the chicken pieces tasted fabulous too – the only dampener was that saffron was on the higher side thus overpowering the overall taste. There was absolutely no similarity with Hyderabadi biryani though. The Gulare Pyaaz Raita was a good accompaniment for the biryani. I did not try any dessert apart from Amrit Phal – which was a chhena based preparation very close to Bengali chumchum. Milk Halwa and Double Ka Meetha were also served. A dessert named Meethi Dahi sounded interesting, but it was not part of the day’s menu, neither was the famed Makkan Peda, a Gulab Jamun like sweet from Arcot. Chef explained that the menu changes everyday and they would be available on some other days of the festival. I found the Arcot cuisine distinctly less spicy than Hyderabadi – possibly I can describe it as a tangier version of Mughlai food, with a lot of tomatoes used in it. 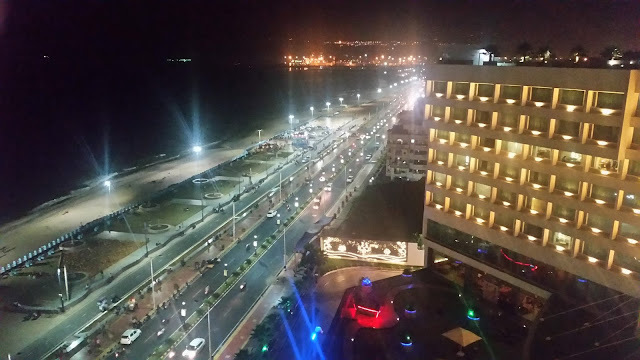 The promotion is as part of the regular buffet at Deccan Pavilion, where there are other regular items in the buffet apart from the food festival menu. It is priced at around Rs 1600 inclusive of taxes. The promotion is on till 22nd November. You got my mouth watering for the history and the cuisine!